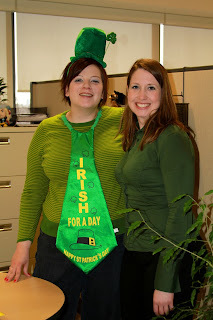 I'm not Irish, nor do I enjoy drinking green beer but I do enjoy dressing up for just about any occasion (as evidenced by me and a co-worker today). Hope everyone had a fun (and safe) St. Patty's Day! Well spring is trying it's hardest to establish itself at the moment. If the old adage "March comes in like a lamb and goes out like a lion" is true then we haven't seen the last of winter yet either. The weather this weekend was particularly warm so on Sunday I drove out to Camrose to visit my friend Sarah. We went for a long walk along the trails around Camrose, stopped by her work at Augustana campus to see the new library and then we went for a drive. This is the tiny community of Tillicum on the shores of Dried Meat Lake about a 10 minute drive from Camrose. Apparently the ice fishing was good this winter; Sarah and I have decided to give our fishing rods a work out this summer. I'm enthused for spring, for the birdsong and for all of the greenery brightening up. What I am most enjoying is the great weather to walk home from work in daily. Soon enough I'll be out rollerblading! I never turn down an opportunity to spend time at my parent's place and I actually booked a week of vacation time to go back to Saskatchewan and spend time with my family. I apologize to my friends back at home, I didn't call because I actually wanted this vacation to be about my family. I'll get you all on the next trip! Nothing seems more appealing to me then to wake up to the frosty winter wonderland at my parent's farm. We had a lot of foggy mornings that made for pretty hoar frost on the trees (and on my dog). Add to the experience watching the end of the Olympics with my parents and then learning my first scales on my grandfather's violin and it was a memorable week! My visit wouldn't be complete though without an epic road trip to visit my sister in Saskatoon and then take her down to Saskatchewan's capital city, Regina, to visit our brother and his girlfriend. It was her birthday so we celebrated with some dress-up bowling and dancing at the club. So maybe it wasn't the most restful of vacations but I had a fun week packed with a lot of family. I couldn't ask for anything better. With Easter coming I'm sure it will be a bit of a repeat!